3-Charlotte Ruby Myrtle Richardson was born on 16 Mar 1890 in Exton, Tasmania, died on 6 Sep 1941 at age 51, and was buried in Whitemore, Tasmania. Ruby was born on 16th April, 1890 at Exton. As she grew up she became a very good cook and made all the pastry for her own wedding reception. 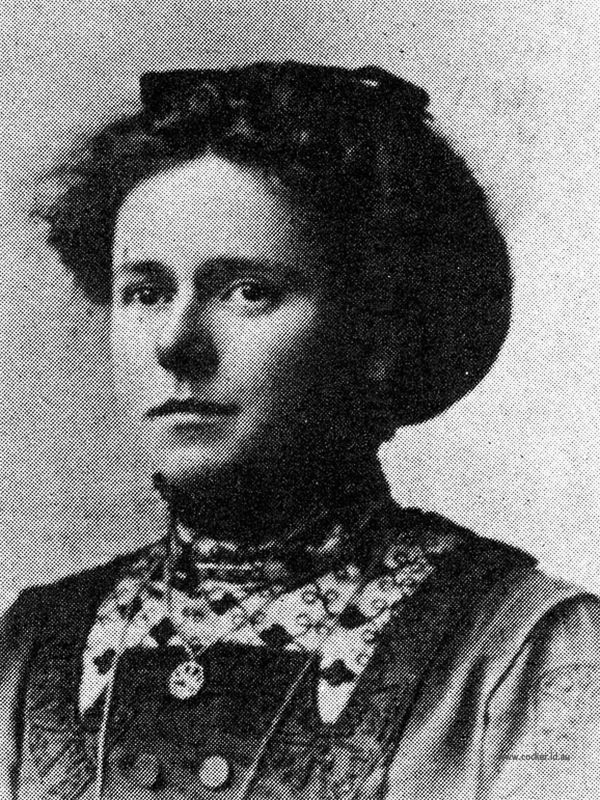 She married Basil Melmouth Badcock on 21st May, 1913 and lived at Whitemore. Throughout her life she was renowned as an excellent cook. Often she would make up to 16 dozen sausage rolls for tea meetings and church functions at Glenore and Whitemore. She always assisted her husband, Mel, with his stud stock. He had champion Clydesdale horses, English Leicester sheep and Devon cattle, which he exhibited at many agricultural shows. Ruby helped with the grooming of the cattle and decorating the horses with pom-poms etc. On the Tuesday morning before the Launceston Show, 13 sheep would be loaded on a horse-drawn wagon to be taken to the railway station and the cattle and horses were walked the three miles to the station. One special cow called Fairy, once the halter was put on her, would wander off to the gate anxious always to be away. There were five daughters of this marriage — Jean, Vera, Merle, Beryl and Beverley. Ruby's health failed at an early age and she died on 6th September, 1941 aged 51 years and was buried at Whitemore. 4-Jean Mary Badcock was born on 7 Sep 1914 in Whitemore, Tasmania. Jean married Ivan Hoggett, son of John Hoggett and Helen McCarthy. Ivan was born on 24 Mar 1909 in Conara, Tasmania. They had two children: Mary Jean and Helen Leslie. 5-Mary Jean Hoggett was born on 27 Dec 1943. 5-Helen Leslie Hoggett was born in 1950. Helen married Philip Morton Connor. Philip was born in 1947. They had two children: Andrew and Jennifer. 6-Andrew Connor was born in 1977. 6-Jennifer Gail Connor was born in 1979. 4-Vera Alice Badcock was born on 1 Apr 1917 in Glenore, near Hagley. Vera married Hedley Lloyd John McCullagh, son of Lloyd McCullagh and Coral Ethella Walker. Hedley was born on 1 Mar 1909 in Green Banks, Tasmania. They had two children: Patricia Ruby and Ross Lloyd. 5-Patricia Ruby McCullagh was born on 10 Oct 1948. Patricia married Brian Maxwell Armstrong. Brian was born on 19 Mar 1948. They had two children: Glen and Duncan. 6-Glen Armstrong was born on 20 Nov 1974. 6-Duncan Armstrong was born on 24 Mar 1977. 5-Ross Lloyd McCullagh was born on 4 Jan 1952. Ross married Louise Ann Larter. Louise was born on 2 Nov 1952. They had two children: Searl Lloyd and Penni Louise. 6-Searl Lloyd McCullagh was born on 7 Jun 1975. 6-Penni Louise McCullagh was born on 2 May 1979. 4-Winifred Merle Badcock was born on 7 Mar 1921, died on 16 Aug 1994 at age 73, and was buried on 18 Aug 1994 in Launceston. Winifred married Fordyce Dudley Pearn on 14 Apr 1945 in Launceston. Fordyce was born on 17 Dec 1920, died on 25 Jul 1994 at age 73, and was buried on 28 Jul 1994 in Launceston. They had three children: Barry Gordon, Heather and Alan David. 5-Barry Gordon Pearn was born on 3 Dec 1945. Barry married Beryl May French. Beryl was born on 31 Oct 1947. They had two children: Angela Louise and Stephen Nigel. 6-Angela Louise Pearn was born on 5 Apr 1971. 6-Stephen Nigel Pearn was born on 23 Nov 1972. 5-Heather Pearn was born on 6 Oct 1949. Heather married Wayne Leigh Richardson, son of Harold Isaac George Richardson and Edith Olivia Maude Stone. Wayne was born on 20 Jun 1944. They had three children: Clare Isobel, Laura Jane and Kate Olivia. 5-Alan David Pearn was born on 8 Jul 1958. Alan married Kristine Ann Cameron. Kristine was born on 22 May 1955. They had two children: Kelli Ann and Natalie Dawn. 6-Kelli Ann Pearn was born on 10 Mar 1982. 6-Natalie Dawn Pearn was born on 30 Oct 1985. 4-Beryl Ruby Margaret Badcock was born on 16 Apr 1929. Beryl married Ivan John Ferris Damon. Ivan was born on 22 Jan 1930, died on 14 Nov 2005 in the Launceston General Hospital at age 75, and was buried on 16 Nov 2005. They had three children: Margaret Beryl, Judith Louise and Susan Elizabeth. 5-Margaret Beryl Damon was born on 23 Nov 1951. Margaret married Paul Arthur James. Paul was born on 24 Oct 1950. They had three children: Richard Paul, Scott Damon and Alison Margaret. 6-Richard Paul James was born on 7 Jan 1976. 6-Scott Damon James was born on 21 Jan 1978. 6-Alison Margaret James was born on 25 Jul 1980. 5-Judith Louise Damon was born on 27 Feb 1956. Judith married Darryl Arthur Wing. Darryl was born on 12 Jul 1944. They had two children: Geoffrey George and Elizabeth Ann. 6-Geoffrey George Wing was born on 4 Dec 1984. 6-Elizabeth Ann Wing was born on 9 Feb 1987. 5-Susan Elizabeth Damon was born on 22 Apr 1958. Susan married Stephen Ronald How. Stephen was born on 18 Oct 1954. They had two children: Megan Elizabeth and Laura Ashley. 6-Megan Elizabeth How was born on 19 Sep 1985. 6-Laura Ashley How was born on 5 Dec 1987. 4-Beverley Dawn Badcock was born on 17 Dec 1930. Beverley married John David Arnold. John was born on 21 Nov 1927. They had two children: Paul Anthony and Graeme John. 5-Paul Anthony Arnold was born on 21 Nov 1956. Paul married Lynette Jean Boon. Lynette was born on 29 Sep 1956. They had two children: Nicole Kerin and Shannyn Courtney. 6-Nicole Kerin Arnold was born on 11 Aug 1982. 6-Shannyn Courtney Arnold was born on 17 Sep 1985. 5-Graeme John Arnold was born on 13 Jul 1959. Graeme married Andrea Rigby. Andrea was born on 24 Feb 1962. They had one daughter: Laura Claire. 6-Laura Claire Arnold was born on 7 Apr 1988.